Tiny Epic Something-or-Other | SPACE-BIFF! Maybe because of the unspoken nerd prestige that accompanies 4X games (explore, expand, exploit, and exterminate, for the uninitiated), or perhaps because the previous two titles from Gamelyn Games, Dungeon Heroes and Fantasy Frontier, both ranked alright-to-okay on Space-Biff!’s Universal Objective Scale of Personal Preference, Tiny Epic Kingdoms really wants you to think of it as a 4X game. But that’s somewhat misleading, because Tiny Epic Kingdoms isn’t really a 4X game. It’s more of a 3X game, which is just a 4X game minus an X — in this case, exploration, because there is absolutely no exploration in TEK. Unless laying a map tile on the table at the start of the game counts as “exploration,” in which case nearly every game is about exploration. 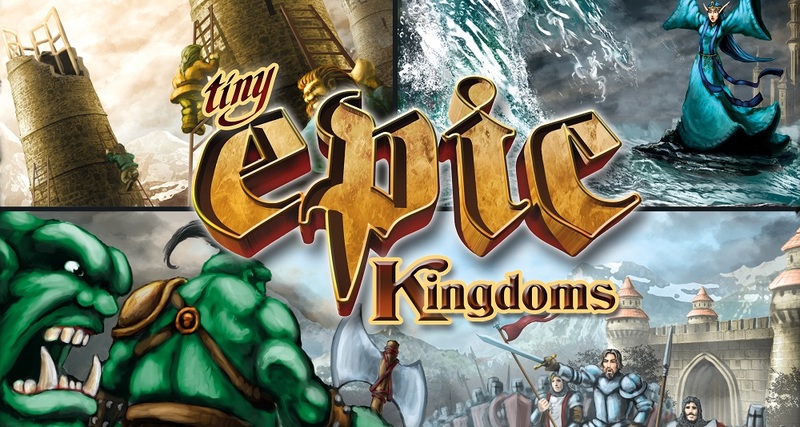 Not that it matters one dang bit, because Tiny Epic Kingdoms is easily the best title we’ve seen so far from Gamelyn Games. A kingdom of tiny epic Valkyries. 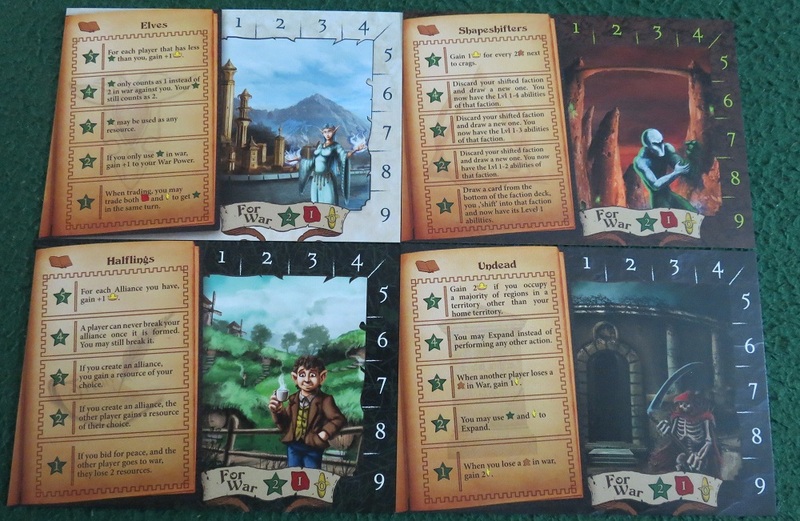 I’ve noticed a few folks drawing parallels between Tiny Epic Kingdoms and two of my favorite games from last year, Eight-Minute Empire and its sequel Eight-Minute Empire: Legends, which were standouts for their tiny boxes, smart and quick gameplay, and Ryan Laukat’s gorgeous artwork. And while I don’t think the two are really all that similar, it’s easy to see why people have been making the comparison. Tiny Epic Kingdoms is also compact — smaller than either of the 8ME boxes, in fact — also smart, also quick, and also generally easy on the eyes. The question, then, is whether TEK is an Eight-Minute buster. The answer depends on your criteria. For me, the appeal of a game like Eight-Minute Empire is in its simplicity and ease of play, and Tiny Epic Kingdoms ramps it up on pretty much every front. It’s longer, giving you a bit more time to develop your fledgeling kingdom; it sees you managing more resource types, and in general it’s more complex, with a variety of different actions, including a race to build an enormous tower and a tech tree ladder to climb; and, most impressively, a big old pile of maps to expand across and races to play as. These different races are possibly the most mesmerizing of TEK’s offerings. Whether playing as the alliance-abusing Halflings or the tower-building Dwarves, each of the game’s thirteen races come with their own distinct feel, and it’s a lot of fun learning what makes each of them tick. Does this make it a better game than Eight-Minute Empire? No idea. Personally, I like Eight-Minute Empire a bit better, but as I mentioned above, I don’t think the two games are really all that similar. So instead, let’s talk about what makes TEK stand on its own. A tiny epic action board. While the maps and races might be Tiny Epic Kingdom’s more flashy components, its beating heart is found in its action system. Each game sees players settling a pair of meeples on their own personal map tile. From there, the goal is four-fold: expand your population, learn magic, build the tower, and conquer city spaces. On each turn, a player picks an action, marking it off on the action board. There are six in total, including a couple that let you move your guys around your map or onto other players’ maps, a few that let you spend your ore, mana, and food to further your goals, and the final trade action, which is mostly the spot you’ll pick when you want to block someone from doing something better. The trick is that when you pick an action, each other player also gets to take it, so the best course of action is usually to quietly figure out which action will benefit you without helping everyone else at the same time. For example, in one recent match I was playing as the Orcs. I’d been eying my third magic level for a while because it makes the Orcs better in combat, and everyone knows an Orc loves a good fight. More importantly, the dippy Merfolk had recently moved onto my map and I was looking to push them off. The problem was, if I took the research action (exchanging mana for a level-up), the pesky Valkyries would also be allowed to research — and their third level forces everyone else to lose three resources. Now, you might be thinking that my optimal move was to avoid researching for the time being. Maybe the Valkyries would use up their supply of mana in a battle, giving me a chance later on to research without giving them the opportunity to level up. Good thought, but you’d be wrong. See, in this case, I knew the Valkyries would choose to research if I didn’t, and I’d lose those three resources anyway. In this particular instance, the player order went me-Valkyries-Centaurs-Merfolk, and if the Valkyries researched and hit level three before I got a chance to research, I’d be out of luck, because I had exactly as much mana as I needed to level up. Instead, I chose to research. I went up to level three, and so did the Valkyries — at which point their ability triggered and everyone else lost three resources. Since I’d already spent my mana, I only had a couple measly food left, and that’s all I lost. But for both the Centaurs and Merfolk, the loss took away some of their mana, preventing them from researching at all. Boom. Not that it set them back too much. Whenever you can’t or don’t want to take an action, you can instead opt to harvest resources from the territories you control. This is a light game, after all, and nobody is ever knocked out of the running for very long. And that’s just the most crucial of Tiny Epic Kingdom’s innovations. War, for instance, is handled by wagering resources in secret on a twelve-sided die, then revealing it and grunting in frustration when it turns out you just wagered away a huge pile of mana and ore while your opponent opted for peace. Good job, meanie. You may have taken the territory, but you may have just lost the long game. Or there’s the way you can send your minions to occupy cities, useless other than for a couple points at the end of the game, or “search” ruins for a resource of your choice every time you harvest. And then there are the really nifty factions, like the absurdly mobile Lizardfolk, the wildly expanding Centaurs, the Humans and their not-useless trading, and the faction-changing Shapeshifters. Really, Tiny Epic Kingdoms is just a fantastically pleasant experience, light and fast enough that it doesn’t really matter when you get blocked from a particular action, but deep enough that you’ll do a tiny epic fist-pump beneath the table when you pull off a cool move. There’s a whole lot crammed into that pocket-sized box, absolutely one of the best filler-type games I’ve played this year. Strictly speaking, it may not really be a member of the 4X genre — at least not without the exclusive Kickstarter “exploration tokens” that just give you little perks or hindrances when you move into certain territories — but the other three eXes are so well done, you’ll hardly miss that last one. Posted on November 2, 2014, in Board Game and tagged Board Games, Gamelyn Games, The Fruits of Kickstarter, Tiny Epic Kingdoms. Bookmark the permalink. 14 Comments. Excellent review! I completely concur with your description of how it requires you to make these non-obvious moves in order to keep from benefiting your opponents. I’ve been wearing out my copy of TEK for about two weeks now. It truly is not a 4X, and it surprises me to see how many people have been repeating that party line — it isn’t a 4X, and it doesn’t need to be, so why all the pretense? Let’s celebrate it for what it is: a worthy addition to the Kickstarter breed of “filling filler” that was spearheaded by Eight-Minute Empire. Thanks for the review! I’m definitely getting this one asap! And right there, that’s why Dogs of War being overproduced is a bad thing. Gorgeous to look at but cost prohibitive for a relatively light game. But yeah, “hidden commitment” is a great phrase to describe TEK’s combat. I backed the basic version on Kickstarter and haven’t regretted it at all. The number and variety of factions is pretty great, and it’s just deep enough to allow for interesting gameplay and come-from-behind wins without getting bogged down. I’ve never had a game play in the advertised 30 minutes, but maybe we just need more time with the game, or just take too much time per turn. I agree on all counts. Most of our plays have lasted closer to 45 minutes (at least the matches with a full complement of five players), but we’ve always had a couple people spend a touch too long deciding which action they’ll declare. Pingback: Best Week 2014, Day Two! | SPACE-BIFF! Pingback: Sometimes “Tiny” Ain’t a Compliment | SPACE-BIFF! Pingback: Tiny Epic Review | SPACE-BIFF! Pingback: From Dud to Dude | SPACE-BIFF! Pingback: Fully Epic, Too Tiny | SPACE-BIFF!